This bibliography is by no means complete, and all of the articles mentioned above will lead the reader to more specialized papers. Everything was running on schedule. The Beta parts had all arrived within two or three days of deadline, the assembly facilities we're busily stuffing the PC boards. All looked well. Then a disturbing quality was noted on the PC boards. They weren't taking solder very well. A lot of rework was necessary, and when the rework was being done, the solderability problem got worse. By now it was 7 December, Pearl Harbor Day. It was agreed that the PC house would get us the first boards ASAP (they were all due on the 7th) so we could get rolling with testing. More delays. More problems. More	calls. The solderability of the boards was becoming a major	production setback. The chief engineer at the PC fabrication facility was dispatched to one of the two assembly points (both were experiencing the same problems) to attempt to find	the cause of, and hopefully a solution to, this problem. Late Wednesday afternoon a batch of 19 Beta boards were delivered to the anxious checkout crew. Immediately Lyle, WA7GXD, and Pete, WB9FLW, (later joined by Den, KD2S and Dan KV7B) set to work on the boards. Test Number One was to apply power to the boards with no socketed ICs in place to ensure that the voltage regulators were working -- we didn't want to fry $150 worth of chips! All 19 boards passed with no problems. 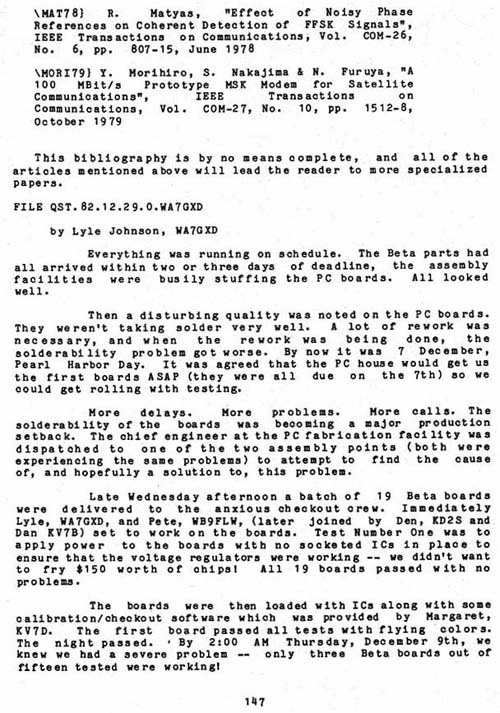 The boards were then loaded with ICs along with some calibration/checkout software which was provided by Margaret, KV7D. The first board passed all tests with flying colors. The night passed. By 2: 0 0 AM Thursday, December 9th, we knew we had a severe problem -- only three Beta boards out of fifteen tested were working!